(if you take more than 20 injections at a time). Injection lipolysis achieves a permanent reduction in fat deposits, especially in those places that cannot be specifically targeted by dieting or exercise. The treatment is gentle, virtually pain-free, low risk with no downtime and your ability to work is not impaired. For a long time, liposuction was the only means for removing accumulations of fat. But with the aid of injection lipolysis, it has now become possible to eliminate small to medium deposits of fat with minimum intervention and minimum stress to the body. The main difference is that injection lipolysis is a non-operative method of treatment, whereas liposuction involves a surgical procedure. With liposuction, the fat disappears almost immediately. Injection lipolysis allows a slower change to the body contour, allowing the patients also to gradually get used to their change in appearance over a period of several months. Injection lipolysis is also an ideal method of treatment following liposuction in order to remove any remaining fatty tissue and also tauten the surrounding skin. As a rule, most patients require 1-4 treatments at intervals of 2 - 3 weeks apart. As there are few nerve fibers in the subcutaneous tissue, the injections are not painful. Patients only feel a slight initial prick and, for the first few hours, a slight sensation of itching and/or a tissue warming. Results may be visible approx 2-4 weeks post treatment with the majority of changes occurring between 4-6 weeks. In some instances the patient may not notice anything until after the second treatment. Lipolysis is the latest thing in non-invasive (non-surgical) cosmetic treatments that gradually and permanently removes unwanted fat cells from specific target areas. Lipolysis means the decomposition of fat cells. For years, Cardiologists have been giving patients phosphatidylcholine, extracted from soy, to help unclog arteries and lower cholesterol. That same technology is now used cosmetically to remove fat. Injection Lipolysis therapy has grown rapidly worldwide due to its success for reducing: spot fat, wrinkles, cellulite, stretch marks, loose skin, lipomas, infra-orbital eye fat pads and post-surgical contour irregularities. 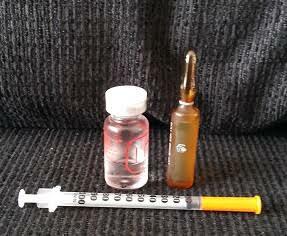 What is the injected solution and how does it work? The injected solution used in Injection Lipolysis primarily consists of two substances, phosphatidylcholine (PPC) and deoxycholic acid (DOC). PPC and DOC are abundant in the human body and they contribute to cell membrane integrity and metabolizing fats. This led to using these substances intravenously for treating conditions such as fat embolism, atherosclerosis and liver disease. These substances are approved in many countries under various brand names, such as Lipostabil N®, Essentiale® and Lipobean®. DOC (a bile acid) acts as a solvent to make the PPC injectable. The soy extract, called polyenylphosphatidylcholine (PPC), is high in purity and contains no protein, therefore there is no allergic response. PPC also has two bound unsaturated fatty acids, and it is these in particular that are responsible for its therapeutic effects in lowering cholesterol. Injection Lipolysis involves direct placement of our natural substance, using very thin needles, into the subcutaneous tissue. The solution breaks down the fat cell’s membrane and impairs that cell’s ability to function. Our immune system responds as it does to any foreign substance in the body and disposes of the fat naturally. The skin is nourished and retracts smoothly over the re-contoured area. Limitations for Injection Lipolysis Therapy? And why? People who are allergic to soy Reason: May cause allergic reaction. Children & Adolescents Reason: There has been no documented research done with these groups. Pregnant or Breastfeeding Women Reason: There has been no documented research done with these groups. After Recent Surgery (1-3 months) & people with recent diagnosis of severe disease Reason: IL therapy permanently destroys the fat cell membrane. This creates foreign substances within the body that naturally call on our immune system for safe removal. People who have been recently diagnosed with disease or undergone recent surgery need their immune system to fight against whatever is going on in their body medically. We would not want to compromise their body defenses for a cosmetic treatment. Insulin Dependent Diabetics Reason: PPC nourishes the cell membrane and could restore the cells ability to take in insulin and could cause a hypoglycemic condition. Face and neck – 1 - 2 treatments. Treatments are administered 2 - 3 weeks apart. Injection Lipolysis is not intended as a weight loss program. The goal is to decrease body circumference, measured in cm’s. The needles are very thin so the treatment itself is not painful for most people. There is a level of discomfort for 15-30 minutes immediately after the procedure. Then over the next 12 hours the treated area swells up and can cause moderate discomfort for up to 48 hours. For several weeks post-treatment you will experience tenderness to pressure in the treated area(s) when you push on it or bump it, similar to how an old bruise feels. Any feeling in the target area(s) are good indication that the substance is still actively working. Be patient and let the process work for several months. Note: Discomfort levels decrease with subsequent treatments. Is Injection Lipolysis legal and what does off-label mean? Yes, Injection Lipolysis is legal. The PPC/DOC solution (basic, or with varied, yet specific additives) has been approved for intravenous use since 1959 in most countries. In the case of Injection Lipolysis, our compound is used ‘off label’. Off label use is very common. For centuries every physician has had the right to use an approved drug to treat other conditions if he decides it is beneficial. Injection Lipolysis has been determined along those lines. Results have been reported as early as 2 weeks post-treatment. The best time for fat loss is between 4 and 6 weeks. In rare cases, patients may not see visible results until after their second treatment. No unexpected side effects have been reported after treatments following Lipolysis protocols. *** Note: The following tables represent responses that are expected post-treatment up to 8 weeks. Lengths of time are averages. Responses differ with each individual. Is there research on Injection Lipolysis? There are more than 50 scientific publications available specific to Injection Lipolysis. Some testing is done on a large scale and includes double-blind studies. There is scientific evidence which defines Injection Lipolysis therapy as effective, safe, with a low side effect profile as long as the therapist has undergone skillful training. Can multiple body areas be treated at the same time? Are there serious complications with Injection Lipolysis? Many studies include safety as an important aspect of the therapeutic approach. More than 100,000 treatments in total have been documented and the rate of more serious complications is 0.0017%. Compared to many other therapies the complication rate can be called extremely low. No death cases caused by Injection Lipolysis are known.